FILE - U.S. President Donald Trump addresses the 72nd United Nations General Assembly at U.N. headquarters in New York, Sept. 19, 2017. If President Donald Trump moves to scuttle the landmark 2015 nuclear deal with Iran, Israel's nationalist government can be expected to be the loudest — and perhaps only — major player to applaud. But the true picture is more complicated than what Prime Minister Benjamin Netanyahu might portray: There is a strong sense among his own security establishment that there are few good alternatives, that the deal has benefited Israel, and that U.S. credibility could be squandered in the turbulent Middle East in ways that could harm Israel itself. That is not to say that Israel's respected security chiefs are all pleased with every aspect of the Iran deal. But after Netanyahu declared at the United Nations last month that it was time to "fix it or nix it," the prevailing attitude among security experts seems to be that fixing it is the best way to go. "It seems to me that the less risky approach is to build on the existing agreement, among other reasons because it does set concrete limitations on the Iranians," said Uzi Arad, a former national security adviser to Netanyahu. "It imposes ceilings and benchmarks and verification systems that you do not want to lose. Why lose it?" Israel considers Iran to be its greatest foe, citing its decades of hostile rhetoric, support for anti-Israel militant groups and its development of long-range missiles. Israeli decision-makers see a nuclear-armed Iran as an existential threat. With Iran believed to be rapidly closing in on developing nuclear weapons, then-President Barack Obama led a coalition of world powers, including Britain, France, Germany, Russia and China, to the nuclear agreement in 2015. The deal offered Iran relief from crippling economic sanctions in exchange for strict limits on its nuclear program. 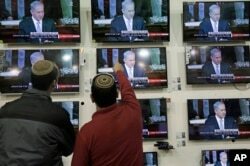 FILE - Israelis watch Prime Minister Benjamin Netanyahu address the U.S. Congress, in a shop in the city of Netivot, March 3, 2015. As the deal was being finalized, Netanyahu frantically tried to block it, claiming it did not go far enough. Among his concerns: clauses that will lift the restrictions on Iran next decade, quick relief from sanctions, an imperfect system of inspections and the failure to address Iran's other belligerent behavior such as missile tests and involvement in regional conflicts. Netanyahu's opposition was so intense that he delivered a speech to the U.S. Congress railing against the emerging deal in early 2015, setting off a crisis in relations with Obama that never healed. On the campaign trail last year, Trump frequently criticized the Iran deal and vowed to rip it up if he was elected. In his own speech to the U.N. last month, Trump called it "one of the worst and most one-sided transactions" in U.S. history. Netanyahu said he had never heard a "bolder or more courageous speech" at the U.N. Following up on his U.N. performance, Trump is expected to "decertify" the nuclear deal on Friday by saying it is not in America's security interests. This would not immediately pull the U.S. out of the deal. Instead, it would kick it over to Congress, which will then have 60 days to decide whether to reimpose sanctions. If that happens, Iran has threatened to walk away. Most of Trump's top national security aides do not want to dismantle the nuclear deal, and America's European allies have also urged the Trump administration not to walk away. Netanyahu's office said he discussed the matter of decertification with Trump when they met last month, but gave no further details. But he is likely to praise any move toward scrapping the nuclear deal. In an opinion column published in The New York Times last week, Michael Oren, Netanyahu's former ambassador to Washington and now a deputy minister for diplomacy, argued that decertification would not be the disaster that critics have predicted. He said if the deal is ultimately canceled, it should be replaced by "crippling sanctions." If retained, he said it should be improved to include stricter inspections of suspect nuclear sites, harsh penalties for violations, and eliminating the "sunset clause" that will gradually end the deal. "Either way, revisiting the agreement will send an unequivocal message to the world," Oren said. "It will say that the United States is truly unwilling to accept a nuclear Iran — not now, not in a decade, not ever." FILE - President Donald Trump shakes hands with Israeli Prime Minister Benjamin Netanyahu during a meeting at the Palace Hotel during the United Nations General Assembly in New York, Sept. 18, 2017. 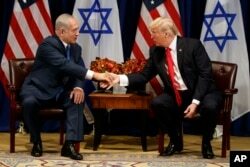 As Trump's decision nears, however, a number of prominent security experts in Israel are publicly and privately advocating that the deal be left intact and its shortcomings addressed separately. These experts say that the U.S., in consultation with Israel, should work with its allies to engage Iran on their many concerns. Simply walking away would hurt American credibility and put it at odds not only with Iran, but with its partners who remain committed to the deal. "You cannot reverse that easily without paying a price," said Arad, Netanyahu's former security adviser. "It would simply be a suboptimal and riskier route to go. So I say build on it, reinforce it, enforce it and address other issues without causing kind of self-inflicted losses in the process." Arad said that while there is a healthy debate over how to move forward, he believes that based on his discussions with both retired and active security officials, the prevailing view among experts on the issue is that the deal should be preserved. Top military officials, for instance, say that Iran has scrupulously upheld its commitments in the deal. This calm on the nuclear front has allowed them to focus on their other concerns about Iranian behavior, most critically its involvement in neighboring Syria and its support for the powerful Lebanese militant group Hezbollah. "The Iran deal is a deal that contains both problems and shortcomings, but its advantages outweigh the weaknesses by far," said Efraim Halevy, a former director of the Mossad intelligence service. Yaakov Amidror, another former national security adviser to Netanyahu, said he did not think that scrapping the deal is even possible, given the position of America's partners. "What should be done is to enhance it. Make it a much better agreement," he said. Yoel Guzansky, a former Iran specialist on the Israeli National Security Council, said that sending the deal to Congress is a "hasty" decision that could backfire. He said the best way to gain leverage over Iran and alter its behavior is through concerted international action. Working together, he said, the international community could pursue various options, including diplomacy, a U.N. resolution or even threatening military action. "We need to build an international coalition, which we lack right now. No one except Trump and Netanyahu, with all due respect, is supporting this move right now," said Guzansky, a senior fellow at INSS, a prominent Israeli think tank. "I really hope the two gentlemen have a program." Chemi Shalev, a columnist with the Haaretz daily, said Netanyahu was playing with fire by pushing Washington to break an agreement. "Washington's signature on any accord will be significantly devalued, and its demands for new agreements with Iran, North Korea or for Middle East peace would henceforth be greeted with polite mockery," he said. Dan Shapiro, who served as Obama's ambassador to Israel when the deal was negotiated, said the lack of alternatives and the uncertainty that canceling the deal would bring are causes of great concern to the Israeli security establishment. "They don't know what will happen if the deal unravels, but it's much more likely that they're going to be faced with their decision point on Iranian nuclear capability much sooner without the deal than with it," he said.